French physician of the latter part of the fourteenth century, who flourished, according to Carmoly, about 1375. He was the author of a treatise entitled "Sha'are ha-Harkabot" (MSS. Paris, No. 1191, 1; Cat. p. 219), a sort of pharmacopœia, written partly in Hebrew and partly in Latin. Carmoly states that Todros was appointed rabbi of Cavaillon by the "elders of the community," but gives no proof of his assertion. 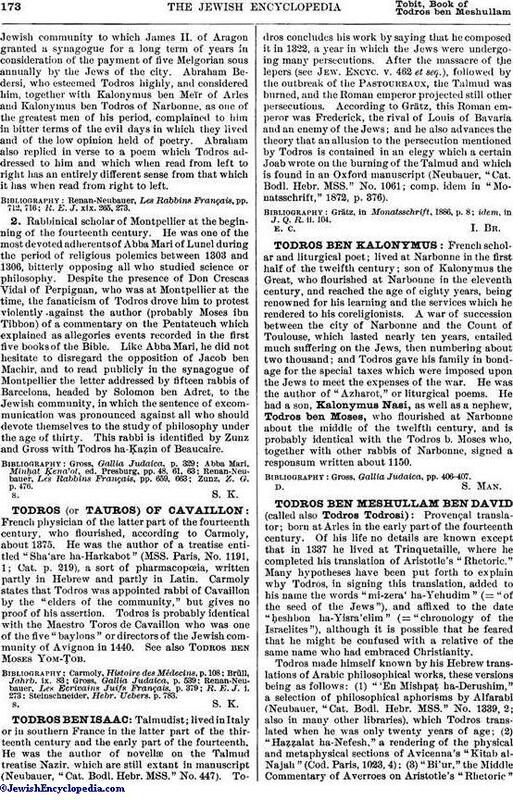 Todros is probably identical with the Maestro Toros de Cavaillon who was one of the five "baylons" or directors of the Jewish community of Avignon in 1440. See also Todros ben Moses Yom-Ṭob. Steinschneider, Hebr. Uebers. p. 783.